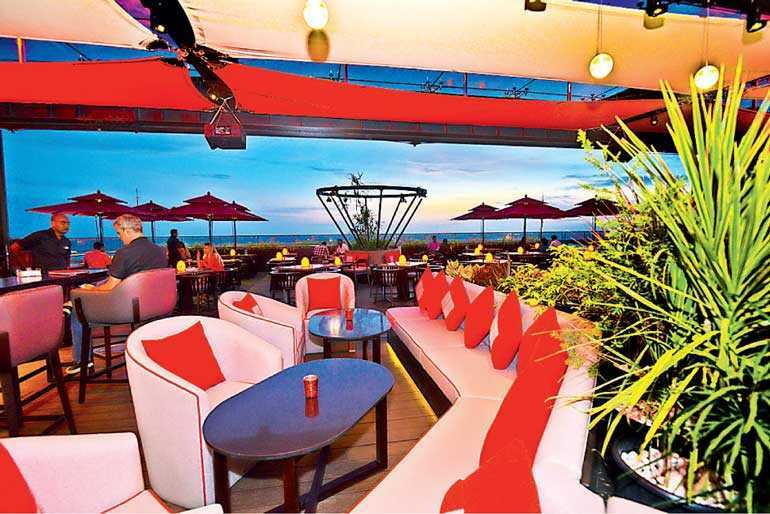 Rooftop bars used to be a rarity in Colombo, and as such the simple novelty of a bird’s eye view of the hustle and bustle below was enough to lure in a segment of customers always on the lookout for something fresh. But, alas, that was then. As with anything, the novelty soon wears off and customers begin to look at other differentiators when deciding with who, what, and where their hard-earned money is spent. Ambience, price, taste, exclusivity, all these play a role in the final decision making process, and it is this melting pot that CÉ LA VI has quietly nestled into. 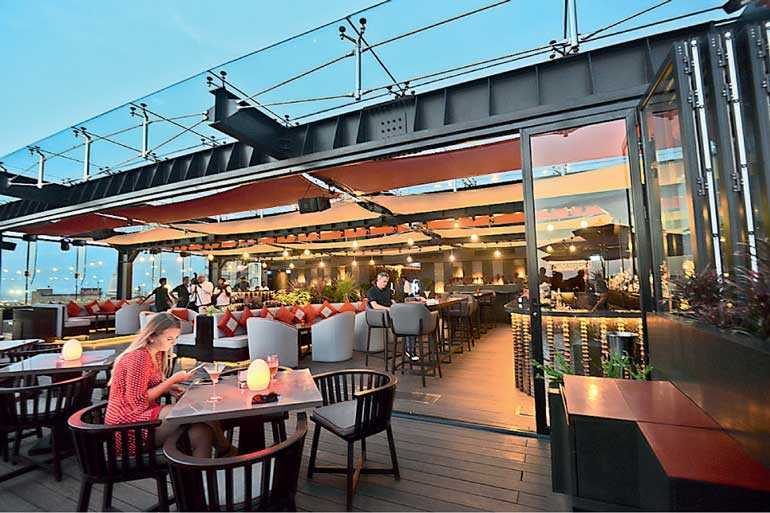 While undoubtedly new, Colombo’s latest enabler of rooftop shenanigans is nevertheless in familiar terrain. Perched atop the regal The Kingsbury, it has replaced the stalwart Sky Lounge, which itself was among the first in the market to identify the lucrative potential of rooftop wining and dining. But where Sky Lounge faulted, CÉ LA VI seems to have ducked and weaved. 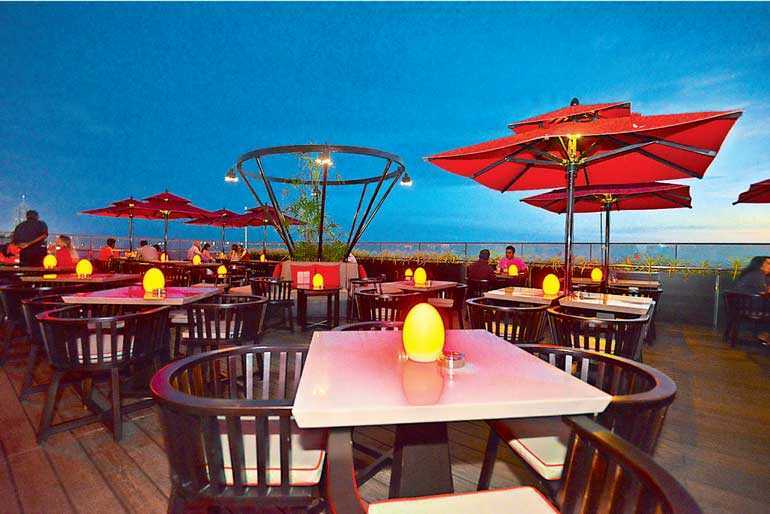 The Kingsbury after all is blessed with a view that none of the other rooftop bars in the city can offer; yes, there are several others that are ocean front, yet how many can boast premium views of the burgeoning Port City? Indeed, even in this early stage of development the enormity of the Port City project offers a grandstand sight, while a glance inwards puts up unparalleled views of the Colombo city scape. Unfortunately for Sky Lounge, they were unable to truly capitalise on this fortuitous positioning, as a congested layout meant guests were cramped out of being able to truly luxuriate in the view. Not so at CÉ LA VI though; done away is the centralised bar and overly-close seating arrangements, replaced now by a section of long couches under an extended roof. The outer uncovered area, meanwhile, has a good number of tables but with enough room to mingle, and yes, even stand idly by the edge and enjoy the view. The colour scheme too has been modified, no longer is blue-ish white the dominant hue, CÉ LA VI – a franchise in several major cities across the world – has instead put in place its trademark red, black, and grey. The effect is considerable, especially in terms of setting the mood – a mood which has also been transformed through the selection of music. CÉ LA VI is known globally for its fine selection of tunes, and Colombo is no exception. Especially curated and overlooked by the brand, during our visit we were treated to a pleasing selection of lounge and chilled out dance tracks with a steady metronome throughout – no Pitbull here, folks. But that’s not to say the music lacks variety, as several nights a week are dedicated to specific genres – Wednesdays are for Classics, Fridays Soul and Funk, Saturdays House – while there are daily Sunset Sessions from 5 p.m. to 9 p.m.
All of which would be for nought if there was no substance behind, but thankfully CÉ LA VI has you covered there. A well-trained band of bartenders patrol possibly the most impressively-stocked bar in Colombo. As to be expected from a global franchise, there are no half-measures. The cocktails, while not cheap, certainly hit the mark, and their flavour and consistency is only outdone by the sheer variety in options. In fact the entire the beverage menu alone runs some 20 pages. The food, however, is where CÉ LA VI truly attempts to set itself apart, starting with a Japanese-influenced modern Asian cuisine restaurant located next to the bar, where a narrow hallway takes you through to one of Colombo’s more intimate dining venues. Interestingly the location for the restaurant didn’t use to exist prior to CÉ LA VI taking over – it was empty space which, in hindsight, seems to have been a massive oversight but thankfully now rectified. The restaurant seats a little under 60 people, to go with the 130 outside, and offers picturesque views of Colombo through giant glass panel windows. The best view in the house is reserved for the sole Teppanyaki table around which guests can sit, taking in both the city-wide views and expert culinary work. Throughout the evening we dined on several items – all of which were excellent – but this review will only cover a few items which we deem are must-haves. We’ve had nachos before, but none quite like this. At once both crispy and fluffy, it leaves a delightful after taste that only leaves you craving more. Enhanced immeasurably by the guacamole and accompanying tomato salsa. Comes with eight pieces of expertly-rolled tuna. The tuna is wonderfully marinated, with the spice evenly spread out. If you’re a lover of sushi, this is one dish you cannot miss. Served alongside garlic chives, kimchi and ssamjang sauce, the pork was masterfully cooked. The top layer of fat had a delightfully crispy skin, while the meat itself was packed full of flavour. If you’re a chocolate lover, this is the dish for you. An uncompromising Chocolate Brownie served alongside Scotch whisky Ice Cream and Frozen Hazel Nut Soufflé. Need I say more? As mentioned earlier, that was just a taste of what you can expect at CÉ LA VI, with the entire menu containing a host of seafood, meat, as well as some vegetarian options. The list of items available for the Teppanyaki alone is enough to make you lose count, while a smaller menu of the same is available for those sitting outside. When this is paired with the outstanding offering of cocktails, genuinely excellent music, and relaxed ambience, CÉ LA VI really is a step above the rest.